Never before have I been more aware that living in the present moment is not always easy, than when I have an idea and it starts unfolding in my head faster than it starts manifesting in reality. It’s as if I want to be there already. There where what I want to create is all done and I can see the manifested version of my great idea. The feeling of not being “there” can be over-whelming to the point where we sometimes feel paralysed in our actions. 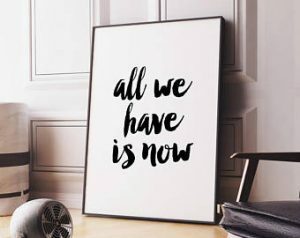 This is where we need to practice present moment awareness and where we must learn to focus on the NOW. The NOW is the only place that we have power. It’s where the idea was born and its where we must stay so that we can let the journey unfold towards the manifestation. Whether it’s a new body, a new version of your SELF or a new business, start where you are! Make a list of all the steps you need to focus on in order to reach your manifested desire and then prioritise these steps in order of importance and flow. You cannot lose 5 kg by wishing that you were 5kg lighter. You need to decide what you must change and what you must add to your diet and your exercise in order to start dropping grams which will eventually accumulated to kg’s. The same with starting a new business. Decide what you want to do and then get clear on what you need to change/remove/add from your current daily routine in order to start creating a new business. 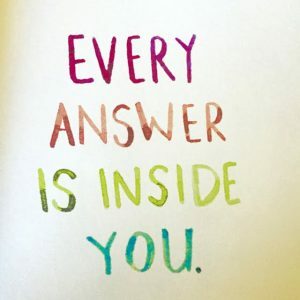 In this present moment you will find the answer to every question that will lead you to the next present moment with the next question and answer & so on and so on. Once you decide that you want it, see it in your mind, write it in your journal and plan it in your day. Then follow the intuitive prompts that life will bring you in each present moment. Start where you are, stay present and listen! LIFE will bring you everything you need to make your dreams come true if you just stay present and engaged with your own life and stay out of everyone else’s. If the shoe fits, own it! I was busy finalising the content of my workshop coming up this weekend when it suddenly occurred to me that the practice of authenticity is such a beautiful thing. In a world where everyone is desperately trying to make their lives appear as perfect as possible, being real is such a breath of fresh air. But did you know that being real is a choice we make not a natural way of being? Until I became really aware of my own feelings and behaviours and I realised that most of the time I was not really feeling into how something fits for me but rather responding from a place of habit. Until I got to know me, I was not being real. For example, exercise was not something I did naturally before because I believed that exercise was not “my thing”. How could it not be “my thing” when I didn’t even experiment with it? And then I learnt to ride a bike and I loved it and recently I’ve started running and I’m loving it. Who knew that my body loves the rush of cardio and the movement. Certainly not me! So coming back to the practice of authenticity. In order to be real and genuine we have to learn to know what fits for us not because society says it must but because it feels comfortable when we try it on. It’s like going into a shoe shop and buying those stilettos because when you step into them you think you become that super model on the cover of Vogue magazine. How many times have you worn those stilettos? Once, twice or maybe they still in that box with the price tag on? Let’s face it stilettos are not a fit for everyone. It’s okay to be a sneakers or pumps kinda girl. If that’s your thing, own it and wear it with confidence. We’ve been so bombarded with the perfect girl stereotype that we’ve lost our sense of self and we’ve lost the most valuable currency we have, our uniqueness. When we bring the truest and realest version of ourselves to our relationships, we bring value to our own life and the lives of others. This being real and authentic thing is hard work because it means you have to say what you really feel and you have to know what that is with certainty. It means you have to dig deep sometimes to establish whether something works for you and if it doesn’t it means you have to be courageous enough to say so. It’s an uncomfortable place to lean into. It’s scary but it’s beautiful. It’s what’s missing in our lives and what we yearn to express without fear of judgement. 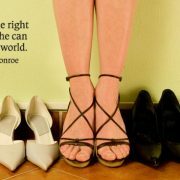 Whatever shoe fits you best, step into it, own it, claim it and go out there and conquer the world! Enough already with the people-pleasing! 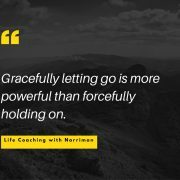 As a life coach and mentor for women I get really close to the struggles women have with their interpersonal relationships and how they continue to show up in their lives. I recently did a survey to establish what behaviours women were battling with and what their pain points were around it. 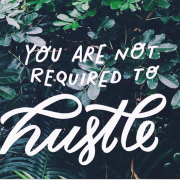 An overwhelming amount of women responded that they struggled with people-pleasing. People- pleasing combined with over-giving is lethal and normally results in exhaustion, resentment and disappointment. 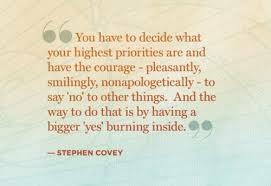 Many of us believe that saying NO, especially to our family and close friends, is a betrayal. In some instances we agree to help or give even when we are down and out and really need some TLC ourselves. I’ve heard women say things like “I just don’t know how to say NO” or “If I don’t do it, it won’t get done”. The thing about being a pleaser and/or a giver is that there are always takers who are willing to receive from you. Blaming them for your behaviour and resenting them for not reciprocating is unrealistic and unfair. Typically, what the giver/pleaser says is “but why can’t he/she see that they are always the one’s receiving and I am always the one giving”. This statement implies that the receiver should therefore willingly give and not have to be prompted or reminded to do so in the relationship. In a perfect world this would be the ideal but we are not living in a perfect world. Another reason why we become pleasers/givers is because we are seeking validation and approval. If you go deep you will find that sometimes your behaviour and actions has nothing to do with helping others but more to do with seeking their approval and being validated for your “goodness”. 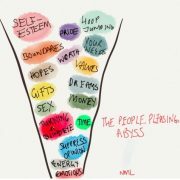 This is not done on a conscious level so it may take some deep introspection and honest self-enquiry to determine your personal motives for being the pleaser. If you are anything like me, chances are that even once you see these motives clearly, you will rationalise them and turn them into something which counts in your favour. It wasn’t until I got really honest with myself and took full ownership of my real intentions that I shifted this behaviour in a meaningful way. 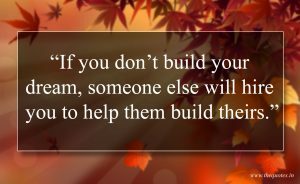 We all have various relationships that require us to play a role in someone’s life. In any one day we are called upon to step into these roles as the situation requires. They can seem over-whelming at times because we are not always able to switch between roles smoothly and effortlessly. The relationship between us and our children requires a different approach and a different interaction than the relationship between us and our husband/partner or even our parents.We establish patterns within these relationships which becomes our default patterns. Some of these patterns are established at a very early age and many of them are establish unconsciously. They become our go-to relationship pattern and they are constantly working in the background of the relationship. All interactions are being driven on a subsoncious level by these behaviour patterns. Our primary pattern is established early in life with our primary care-giver. In most cases our primary care-giver would be our mother but in some cases it could be the father or another person. The primary care-giver is the one who assumes responsibility for our well-being at birth. 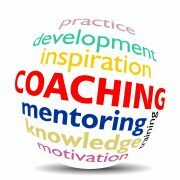 In coaching we acknowledge the fact that all behaviours are established in a mutual relationship and we accept that in most cases you were not consciously aware when you were establishing unhealthy patterns of behaviour. Then we give you the tools to go within to identify your own behaviours and recognise how they are showing up in the relationships where you are struggling. Once you can see these unhealthy behaviours and the role you are playing in perpetuating them, you can start changing them incrementally and thereby shift the dynamics of the relationship. You have to be careful that you don’t confuse pleasing with over-giving. Although they can sometimes feel like the same thing they normally show up differently in your behaviour. In both instances however the motivation is the same. 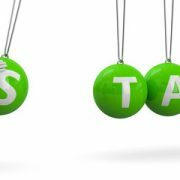 If you are over-giving or you are an obsessive people’s-pleaser then you might want to examine whether you are trying to fix your internal sense of self-worth and value by using giving and pleasing as a bartering tool. In other words, if I give or please you, you will love me, approve of me, validate me and make me feel worthy and valued. Whether you are a people-pleaser or an over-giver breaking this learnt patterns of behaviour and learning new ways of showing up can be difficult and uncomfortable but it is so do-able and so worth trying. 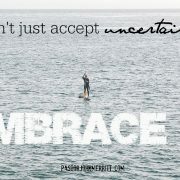 Accept that not everyone is going to like you and that’s ok! – We struggle with this because we’ve been taught from a young age that we should be kind to everyone. Kindness is not the same as pleasing or over- giving though. When our acts of kindness does not include being kind to ourselves, it’s not healthy. Say NO with honesty, no excuses! 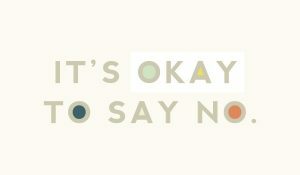 – For people-pleasers and over-givers, saying No to someone feels like you are turning your back on the other person. In a healthy relationship though, the other person will understand when you are not able to do something or when doing something makes you feel misaligned with your personal values. Set boundaries! -Yes, you are allowed to have boundaries and hold them firmly in your life. When you live without boundaries and anything goes, you fall victim to all sorts of abuse and misuse. It’s your life, make sure you are living it within your own integrity and aligned to your personal values. In the process of unlearning patterns that do not serve your greater good you may slip back to the old way of doing things, but do not despair and don’t be too hard on yourself. As long as you trying you are already one step ahead of your old self. In my gut I knew something was wrong. You know that feeling you get in your gut when something feels off? The one we often ignore or pretend we didn’t feel. Well what if I told you that feeling is one of the best ways to tap into guidance and wisdom. We have this built in guidance system that connects us to our Creator. I like to think of it as a little chip HE put inside us all to make sure HE can always communicate with us. When we are in danger even before it manifests itself completely, something in our gut tells us we should watch out. I know you’ve experienced this before, just like I have. 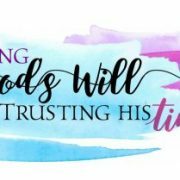 It’s our Creator communicating to us through the little chip or our intuition or gut. Problem is sometimes we ignore the communication. And let me tell you, we always regret it later. We end up saying things like “ I had this feeling in my gut that something was wrong or off, but I did it anyway”. Sounds familiar? What is it with us then? Why do we continuously make choices that goes against our gut hoping that this one time our gut will be wrong? I guess because most times we can’t clearly name and identify what’s wrong or where the danger is. There’s just something in the gut that feels uneasy. Ever been in the company of someone and they make you feel uneasy? You don’t know anything about them. Perhaps you’ve never even met them but something tells you they not to be trusted. 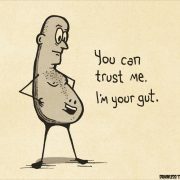 It’s your gut sending you a warning. But here’s the rub, you have no valid reason to believe this person will harm you in anyway. So you shrug it off. Sounds familiar? We can rationalise ourselves into or out of anything. Next time your gut red flags you, take a moment to get still and listen. Even if there is no rational reason, be careful, think again, proceed with caution or not at all. I used to be a perfectionist. Or maybe I was just trying to live up to a standard that I believed was the one I needed to measure myself against. Either way, it was difficult living with this type of pressure. Always trying to do everything “right”. The thing is we can’t get everything “right”. It took me the best part of forty years to learn this lesson. Life has a way of teaching us the lessons we most need through the people we least expect. It was fitting that I learnt the true meaning of living “right” when I experienced the passing of my brother, whom I thought was not getting everything “right” in life. His beautiful departure from this world taught me the valuable lesson of living with compassion as opposed to living with perfection. You see, my brother’s life didn’t live up to my standard of a perfect life but he was one of the most compassionate people I knew. Watching him die the way he did, peacefully and content, was life changing for me. It set me on a path of unlearning some of my perfectionist behaviours and reconnecting to my true nature. What I’ve since learnt about compassion is that it’s one of the measurements of good character. 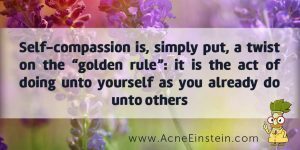 But it doesn’t only include compassion for others, it also includes compassion for ourselves. Self-compassion is something we seldom practice because there’s this myth that self- compassion is self- indulgent and selfish. Another myth is that we have a limited amount of compassion therefore we have to give it to others incase we run out of it. The reality is that once we connect to the compassionate part of us, we access a deep well that can never run dry. Compassion like love, is not a passive emotion. Both love and compassion is something we choose to do and we have to choose it every day in every moment. It’s easy to choose to love someone and it’s easy to choose to show compassion to others when they are in struggle. Our children, our partners, our parents, our siblings and our friends are naturally the recipients of our love, attention, kindness and compassion when they are in struggle and experiencing difficulty in their lives. But what about when we are in struggle? When we give ourselves the emotional resources that we need, we can more easily give to others and we can help ourselves and others move through difficulty easier. Self-compassion like self-talk is a way of being in relationship with ourselves. 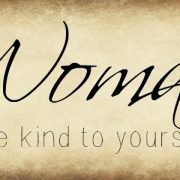 It’s a way of embracing ourselves with care and loving ourselves through our difficult and trying times. Often times when we are in struggle and pain, we use self-criticism and self-judgment instead of self-care and self-compassion. We are human, we make mistakes, we make bad choices sometimes. And often we find that our bad choices lead us to good lessons, so it’s not always a loss. When we can recognise our own mistakes, take responsibility for our bad choices, own our story, the good of it and the bad of it and still remain soft and loving towards ourselves, we are in a better space to rectify, repair and make amends where necessary. 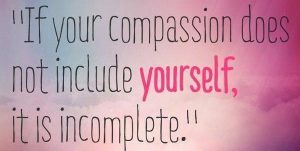 Self-compassion is not self-indulgent, it’s courageous. It’s you saying “ I love myself enough to treat ME the way I would treat others” .